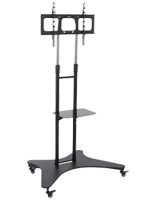 When a BIG picture is required, people choose monitor stands for screens 65" or larger. 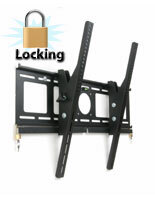 Our collection features mounting hardware rated for a range of big TV sizes, maxing out at 110". 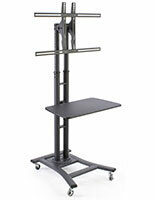 At this level, weight plays an important factor in material and design. 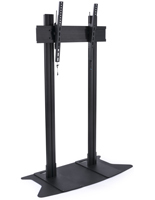 Manufactured with steel for heavy duty applications, these monitor brackets come in all three variations: floor standing, wall, and ceiling mounted. 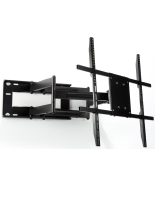 Every fixture features VESA compatible mounting hole patterns to match the holes behind your TV. 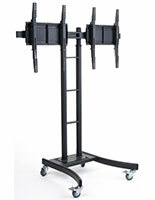 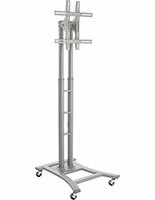 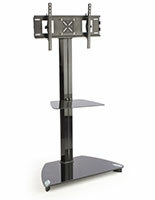 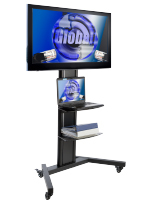 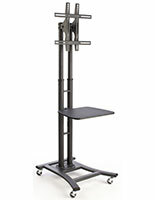 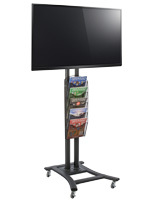 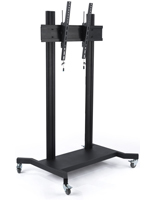 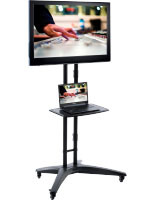 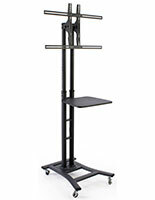 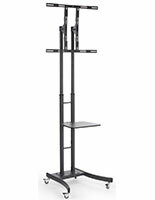 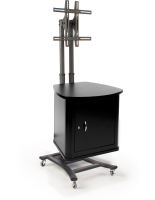 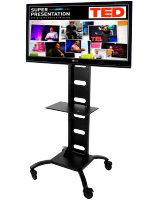 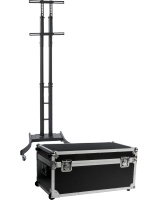 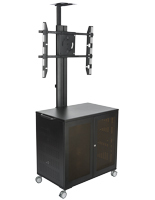 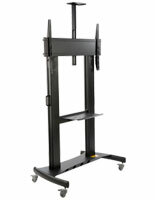 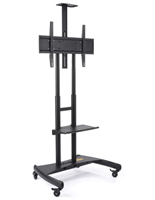 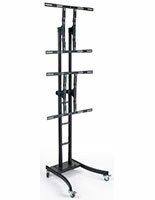 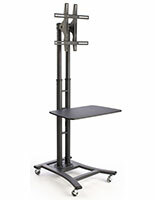 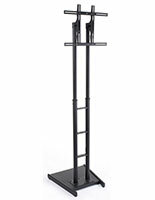 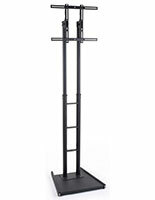 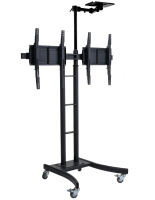 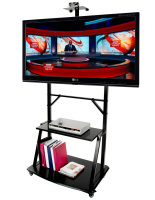 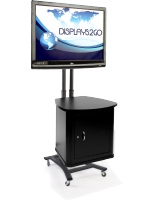 Floor stands for 65" TVs or larger feature rugged construction in order to support flat panels reaching 200+ lbs. 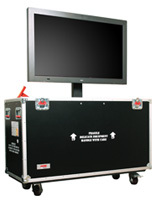 There are a number of specific applications available. 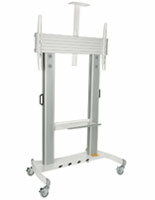 Rolling stands with casters offer great mobility when you need to move the display to and from rooms. 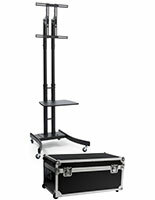 Some models even come with their own travel case which makes them excellent choices for trade shows. 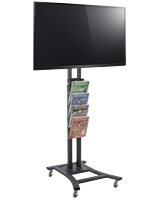 Special monitor stands for display behind storefront windows can place screens right behind the glass for viewing outdoors. 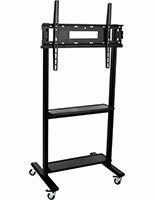 Racks for conference rooms come with integrated storage cabinets below for various A/V equipment. 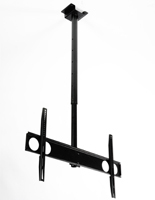 Ceiling brackets are mainstays in commercial airline hubs, office buildings, waiting rooms, or any other public location where lots of people congregate. 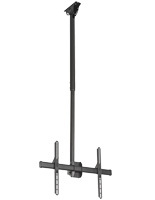 Steel poles extend down from the ceiling with mounting brackets attached. 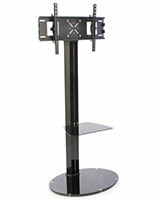 Some models are double sided to provide viewing screens in both directions. 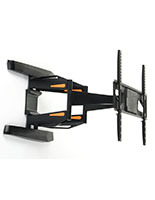 The brackets offer tilt control to optimize the viewing angle, and they also rotate by panning 360°. 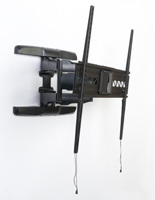 Wall mounts are available in many styles, the most common of which is the "fixed" mount style. 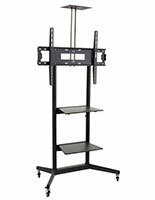 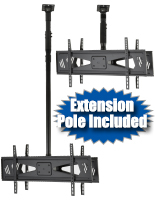 Designed to install your flat screen as close to the wall as possible, these models can be as thin as 5/8" thick. 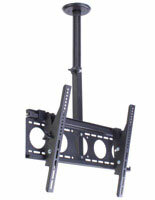 The thinner your TV, the better it will look on the wall. 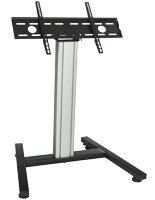 If you plan on displaying the monitor high up, then opt for a mounting bracket with a tilt option in order to angle the screen downwards for better viewing. 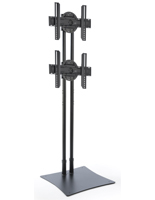 For those users needing full adjustment capabilities, select one of our fixtures with full-movement articulation. 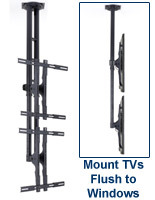 Tilting up and down, panning left and right, extending out from the wall, these are the kinds of features you can expect to get from an articulated wall mount.